Here’s the second “cold” japanese recipe. This is extremely japanese in the taste, if I may say so. Very little ingredients, all typical, of very high quality. Here’s all the japanese culture of taking one ingredient and mastering it, to taste all its peculiar flavour. Which might sound like “it tastes of very little”. But this little is very good!!! Picture snapped quickly while we were already eating. Prepare the mentsuyu according to the recipe. Prepare, on individual plates, a couple of pinches of grated daikon, of chopped scallion, of sesame seeds and a dollop of wasabi, if you like (I didn’t have it on hand so I just skipped it). Boil soba noodles in unsalted water. Drain, rinse in cold water to wash off the slimy consistency, toss them into icy water, then drain very well again. Now it’s up to everyone to customize their mentsuyu: pour some mentsuyu in individual little bowls, and thin it with some cold water, to taste. Then add daikon, scallion, sesame seeds, whatever. 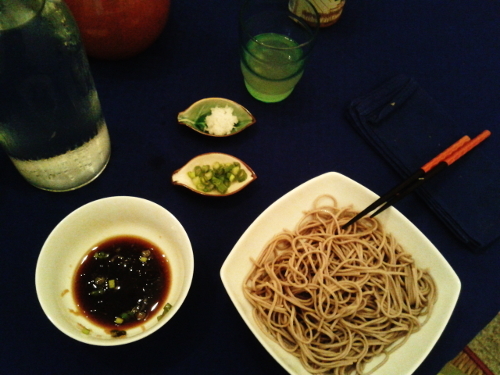 Then take some soba with your chopsticks and dip them into the sauce. If you find it, buy some ginger beer, and serve cold. We always had it in Japan!